The hit USA Network TV show Burn Notice wrapped up its second annual Burn Notice Science Challenge earlier this month. The contest targets high school students and asks them to come up with some kind of new science technology that the characters on Burn Notice would benefit from. If you’re not familiar with the show, it chronicles the life and trials of Michael Weston, a former CIA agent. Weston was once “burned,” meaning that he was dumped by the CIA and had to fend for himself. In this final season, Weston and his gang of rogue spies based in Miami are back working with the CIA again. Some might equate Burn Notice to a present day MacGyver. Throughout the show Weston tells the viewing audience what he’s doing and why he’s doing it, talking about the toys and gadgets that he is playing with. The USA Network is no stranger to innovation, startups, and technology. USA Networks founder Kay Koplovitz is also the founder of SpringBoard, a women-centric accelerator/incubator hybrid helping women with their startups. She is also a frequent speaker at startup events including SXSW. This year’s big winner in the Science Challenge is Craig Owenby, a 2013 graduate of North Gwinnett High School outside of Atlanta. He created a laser communications device that utilizes fluctuating brightness and electrical impulses to audibly transmit messages from more than 100 feet away or around a wall. It’s our understanding that the technology would actually work, and it would be ideal for situations where cell phone or other radio wave signals were disrupted or unable to penetrate. It would also be a good alternative when you were worried about your messages being intercepted. The producers of Burn Notice must have felt the same way. Owenby won a $10,000 scholarship and a paid trip to the set to meet the shows stars and creators. I was one of the first people to see the Jobs movie at an early showing on Thursday evening. One of the big highlight scenes in the movie is when John Sculley recounted the conversation he and Steve Jobs had in New York when Jobs went to recruit the then President of Pepsico to become the CEO of Apple. Jobs once considered it to be the worst move of his career (or at least that’s what the movie and Walter Isaacson’s book suggest). In that conversation Jobs reportedly asked Sculley if he wanted to sell sugar water the rest of his life, or if he wanted to change the world. Well it looks like Coca-Cola isn’t content on just selling sugar water either. Coke has made another global move towards innovatino by supporting startups with nine global accelerators. The company made a bold show of support for startups back in April when it was announced that they were a large corporate sponsor of Startup Weekend and now UpGlobal. VentureVillage reported on Thursday that Coca-Cola has already started accelerator programs in San Fancisco and Sydney. They also just recently kicked off a program in Mexico City, with Rio de Janeiro, Buenos Aires, Bangalore, Berlin, Singapore, and Istanbul all on tap as well. Coke isn’t looking for the next wild flavor or even a revamp of its bottles or cans. They are looking for innovation in distribution and well being. Coca Cola’s global Vice President of Innovation David Butler gave a presentation in early August in Sydney outlining the programs. As to what Coca-Cola is looking for, Butler said it was up to the individual programs across the globe. When asked by an audience member; “So it could be as broad as a Coke-branded wearable device that helps you be healthy or it could be, actually Coke will do your deliveries for you?” one audience member asked. Venture Village also reports that this isn’t Coca-Cola’s first shot at startups and accelerators. In 2001 they formed a startup incubator in their hometown of Atlanta, Georgia, that offered $250,000 in seed capital for up to 12% equity. Bloomberg reports that the program eventually fizzed out for unknown reasons. Check out Coca Cola’s “Innovation Stories” blog here. Sure there are plenty of daily deals startups out there. In fact, one of the most popular Atlanta startups is daily deal startup ScoutMob, but, none have as good a name as Wagglez. Athens Georgia based Wagglez takes it’s name from a dance that honey bees do when they get back to the hive to tell the other bees where the honey is. It’s that same principal Wagglez is hoping to achieve with deal seekers. By delivering relevant local deals straight to the smartphone ,Wagglez eliminates the need to clip coupons or use a daily deals site like Groupon. When a user fills out a profile on Wagglez, their data (minus their personal info like their name) is saved and delivered to participating merchants. Merchants can then analyze the data to see which offers and promotions are working with which demographic. They can then use that data to offer more strategic offers that will benefit both the consumer and the merchant. 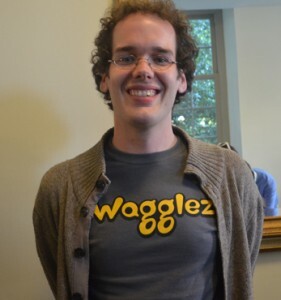 Wagglez wants to make the daily deals experience as easy as possible for the end user. There’s no need to print coupons, all of the participating merchants create the deals themselves, along with the stipulations to take advantage of the deal. This makes the experience as easy as walking into a participating merchant and redeeming your Wagglez deal. Wagglez is incubating at the FourAthens incubator in Athens Georgia along with several other up and coming tech startups. Wagglez wants to be as relevant to visitors as it is to locals. The idea came about when founder Chris Bell and some of his fellow University of Nebraska alums went to a football game in Seattle. They didn’t know where to go or what to do. They were eventually pointed to a bar which some other fellow cornhuskers had taken over. For travelers, Bell is hoping to make Wagglez a platform where out of towners can easily find the best things to do with the best deals as well. Bell was unable to be at the Startup Rally event in Atlanta Monday as he and his wife are expecting a baby, who will also become a Wagglez user. In his place we got to talk with Matt Downing, who even does the Wagglez dance for us in the video. Check it out below. Imagine if YouTube was stripped of all the wannabe’s, all the crappy singers and all the kids who’s parents don’t have the heart to tell them their voices sound like nails on a chalkboard. Imagine if YouTube actually showed the videos from up and coming stars that were truly talented. Well that’s the mission for Georgia startup FameTube. FameTube’s founders Bryan Cornelius and Brad Buttimer hail from Atlanta and Savannah Georgia respectively. Both entrepreneurs love music, people, and media and bring great experience to the table. Their new startup actually vets videos from people who claim to be artists and musicians and sometimes they don’t make the cut. Only those people who get past the FameTube team actually get their videos posted. As Cornelius explains in the interview below, once a video makes it onto FameTube artists are encouraged to drive traffic to the site. The community, outside of the artist and their friends and family are more inclined to check out the other artists and interact. 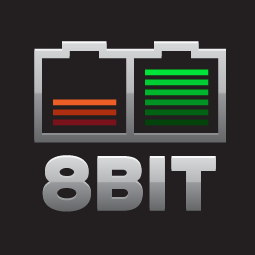 8Bit is a wild gang of extremely talented and creative web publishing rockstars building a platform to give those web publishers without their creative fire access to an arsenal of great design. The Gwinnett Georgia based startup is the latest winner of the Gwinnett Innovation Park $25,000 Founders Grant. While at first look you may get the impression that 8Bit is just another Word Press theme shop and those are about as common these days as Android developers, but when you dive through their site you’ll see that they’re super hero’s of the web publishing space and have compiled a bunch of great values that go into their work. When you read their about page, creativity and urban,word pressing hipsterism seep out of your computer like a mocha latte seeping through the bottom of the Starbucks cup in your center console. If you read their blog and look at their actual work though, you’ll see they aren’t just a bunch of templates. Each of their themes is customizable to the hilt. If you’ve been using Word Press for years, like we have, and you’re still not sure what all the different appearance settings do, no worries 8Bit spells it out for you in their themes while keeping a semblance of classy elegance. In fact 8Bit is so well liked that Mashable and TNW have featured their themes. 8Bit also offers customer support, a novel idea compared to the idiots of douchebaggery we bout this template from. Oh but we’re reporting about their cash. “The Founders Grant Award is intended to give back to the entrepreneurial community by rewarding entrepreneurial excellence and helping deserving companies continue on their path to success,” said Leland Strange, local serial entrepreneur, investor and long time supporter of Atlanta technology innovators to the Gwinnett Business Journal. Well we’ll be honest with you here, when we read the initial synopsis of Vigia we thought it wouldn’t be that exciting. When Anthony Guglielmo got on stage and started talking about a bee sting, we were still on the fence. However that bee sting shed light on a much bigger problem for college students on large campuses that has really snowballed in recent years as wireless phones and smartphones became more prominent on college campuses. The problem here is that college campus’ public safety infrastructure is disrupted on a 911 call by the wireless companies who are required to route phones to the nearest 911 center. To put it in perspective for you, if you got stung by a bee, and were allergic to bee stings without an epi-pen near by, you would most likely call 911. From there you would be routed to the county or cities 911 center not your campus security or EMS. In an incident like that the few seconds or minutes could prove fatal if you don’t get your medicine in time. Perhaps it’s because of the recent tragedy in Colorado, but getting direct access to campus security and public safety could prove to be life saving for a number of reasons. Enter Vigia, a startup from Athens Georgia. Vigia is a platform that allows a smartphone to connect directly to their public safety professionals and dispatchers and enhances the emergency services for the public. In addition to routing your call more efficiently you can also add a profile to your device. If you’re allergic to bees, medicine, diabetic, or have any other medical condition, a profile could be delivered to a 911 center that could get you the help you need quicker. Check out Guglielmo’s pitch video below, you’ll agree that Vigia is a great idea. We’re on a sneaker-strapped, nationwide startup roadtrip and need your help here.